The Roll Over AMerica tour began with a great media event and send-off by the mayor of Portland at the city fountain. The crowds gathered, and questioned the riders about the upcoming adventure and our strange machines. TV, radio and newspaper interviews were given and off we went on the first leg of an epic journey. The second day turned out to be the most important day for this rider. Miles of dodging tire parts, wires and other debris on the shoulder of Interstate 84 resulted in about twenty flats for the day, including two for this rider. In spite of detesting the dangerous interstate riding, I was feeling pretty good about the bike and engine. I called the shop during a long climb and requested a gps to be shipped to me at one of the next stops. After lunch, in Arlington, Oregon, we were making good time, when everything changed. During a medium decent, I saw a bridge approaching at the bottom of the hill. The heavy duty truck rumble strip separated the shoulder we were riding on from the traffic lane, and went all the way to the bridge, where the shoulder was discontinued. To cross the bridge would require crossing the rumble strip and entering the traffic. Four riders up ahead had managed it, and were beginning the next climb. Reducing speed by braking, I noticed that the traffic was clear and I angled across the strip. That’s when all hell broke loose. The rear end of the bike, jarred by the vibration of the truck rumble strip, floated to the left about 30 degrees causing the bike to suddenly be at that angle to the direction of travel, floating at 25 mph! When the bike returned to the roadway, the left front tire dug in and the bike, and rider, rolled over to the left. Crashes happen quickly. The Mango first landed on the left side, then the top, then the right side and finally the top again. Somewhere in the roll the front hit the guard rail of I-84, right after my right elbow, forehead and both hands were pressed into the pavement by the velomobile landing on top of me. I then noticed the blood dripping and felt the heat of the abraisions. I was screwed. Unclipping my feet from the pedals, I climbed out from under the machine and waved to the riders up ahead that I was ok, sorta. They had stopped due to a mechanical on someone’s bike and were too far ahead to notice me, I learned later. Riders behind me stopped and helped with first aid. Very inconvenient for everyone. I sagged for a couple days and the wounds began to heal. I have ridden two and a half days since the roll over and a couple of the British riders have begun to quit calling me roll over Jim. Yesterday was a gorgeous ride through the mountains, and today, we finished the mountains and hit the flats, mostly, into Billings, MT. Overlooking the city was a great photo op we will share with you later. A huge storm hit as we pitched the tents and cooled it off a bit. Tomorrow is a long ride into Miles City, where we will spend two days. Will catch up then. Jim, wow, what an adventure! We are all thankful that you weren’t badly hurt and impressed with how you’ve hung in there. Everyone here is following your progress with interest. Ride safely. Hope you’re keep three wheels down!! Good luck and God bless. Hang in there Jim! We are thinking of you! 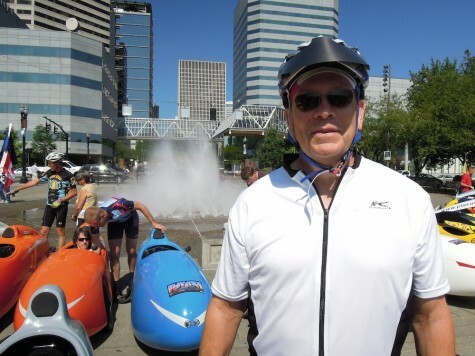 I was following the ROAM posting on the recumbent online mag. Very sorry you crashed. Are you interesrested in unloading the scratched up vehicle nthat was crashed?